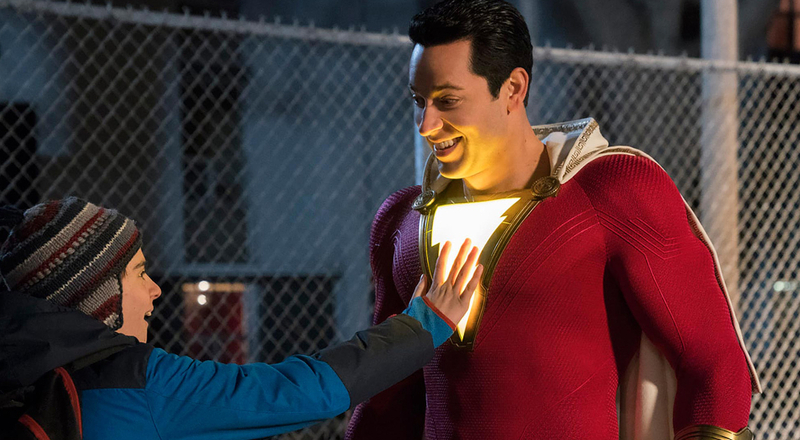 By Kip Mooney • On April 5, 2019 April 14, 2019 • In Reviews	Reviews Comments Off on Review: Shazam! Shazam! has so much going for it that what doesn't work sticks out like a sore thumb. The DC Extended Universe is still finding its footing. Much like my beloved Dallas Mavericks, they're starting to put it together, but they're still not quite there. So let's start with what works. The film's big focus on surrogate families is its biggest asset. Even more so than the X-Men series, this feels startlingly authentic. Billy Batson (Angel Asher) has bounced from foster home to foster home, even good ones. But as his new foster dad Victor (Cooper Andrews) says, they just have to provide a safe place; it's up to him to call it home. After saving his foster brother Freddy (Jack Dylan Grazer, who steals the movie) from some particularly vicious bullies, he's summoned by the wizard Shazam (Djimon Hounsou) and bestowed with his power to protect the world from the forces of darkness. If the film had kept it this generic, it would have been a lot fleeter of foot. Unfortunately, it is patently committed to the comics' convoluted mythology. See, the Seven Deadly Sins we all know – greed, lust, wrath, etc. – are actual demons, and they've given their power to Doctor Sivana (Mark Strong), who wanted Shazam's power but was deemed unworthy. It's yet another lousy villain for the DCEU, through no fault of the talented actor who's been cast. Any time Sivana's onscreen in the first half, it's a momentum killer. Luckily, Zachary Levi is absolutely aces as the new, powerful Billy. Much like Big, he uses his adult appearance to buy beer, gorge on junk food and try to impress women. He's having so much fun that he forgets what Uncle Ben told Peter Parker: "With great power comes great responsibility." (Sorry, wrong universe.) Still, the film winks to the Spider-Man films in another way: with Freddy commenting that a superhero's loved ones are just waiting to be taken by the bad guy. Sure enough, that's what happens, setting up an emotionally tense climax. But what separates this from the rest of the DCEU is the stakes. The world won't necessarily end during this battle, but the people Billy loves and who love him could be hurt or killed. That's the kind of grounding more comic book movies could use. Shazam! is a blast from start to finish, at least when it's not bogged down in backstory. With more emotion and less history, this could be the best part of the DC world. Until then, I'll be adding this to my Christmas movie rotation.